Being a new father can often seem like a full-time job. Even if your baby is breastfed by the mum, there are a lot of other things for dads to do to help take care of your baby, in addition to chores in and around the house. Most other dads, will have to balance the extra work they have at home like caring for their new baby with the demands of their regular job. They may even find themselves working longer hours or at a second job to keep up with the extra expenses that a new baby can bring. 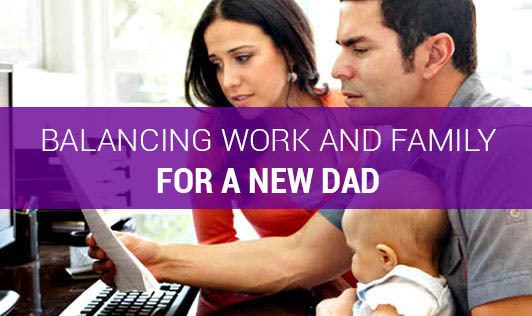 Although working definitely can be important for your career and the financial future of your family, if a new dad doesn't figure out a way to balance the time you spend at work with the time spent with the family, you may miss out on important opportunities to bond with the new baby. Finding a balance between work and family can be especially hard for dads who have to travel a lot as a part of their job. Days or weeks away from home can be hard on a new family, including a new dad who may miss the baby. Having to work at night, so that you have to sleep when your baby is awake during the day can be just as stressful. If your wife was working, you may also lose support from her side as she won't be working for some time now. She might not be willing to take up her job immediately, just to make sure she gets sufficient time to take care of the baby. That might put you into a stressful situation. But do not worry, sit and plan with her and talk to her so that a single problem gets multiple solutions. In addition to trying to spend as much time at home as you can, without sacrificing your own career plans, one of the best ways to balance work and family time is to try and separate the two. Don't bring work home with you, so that when you are home with your family, you are really home and can spend quality time with them. If possible, also try to limit traveling for your job, get on a standard schedule, so that you are home at night and on weekends, and make some special time for your family, no matter how much time you have to spend at work.